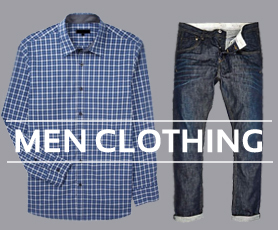 Casual style sense is loved by men for being so effortless and comfortable. After all, who doesn’t want to look practically cool and rock the urban cool and dashing looks? Be it for the parties, or casual outings and weekend errands, the casual outfits will never let you down. You can go bling and sparkle in the metallic jacket, posh in white tee and blue jeans or semi-formal with the blazer and denims. Thus,though it is an easy fashion stance to go for, you need to thoroughly know some tricks and tips dictated by the celebs and experts so that you can don them with perfection for any occasion. The leading wholesale men’s clothing manufacturing hubs have come up with an array of designer outfits, be it the fresh V-neck tees, cardigans to beat winter or the new line of denims. Hence adapting to the brand new fashion statement is becoming easier for the handsome hunks, flaunting their chiselled chests and bulging arms. Here are some of the outstanding outfits and their respective style ideas to rock this season. Men always love to sport the single colored V-neck tees, and hence you need to have a good collection of neutral and dark colored V-neck tees. Nothing can be better than teaming these simple and classy tees with the denims, be it the wide legged or narrow fitted. From the dark washes to light shades and distorted or faded ones, do try everything which can notch up the simple tees double the meter, and wear them with boots. Can you think of accessorising the simple and plain t-shirts without layering them? Yes, this is quite possible now when you wear the beanie caps with them. Especially for the winters , when you are off to some other place , carry this look at the airport and also embrace the punk for parties. Instead of the plain and single colored tees, you can also team them up with the graphic colorful t-shirts. Collared shorts don’t necessarily have to mean formal, they also come with a line and length which is super casual. Thus, get hold of the collared slim fit shirts, and pair them with the tight fitted chino pants, which go till the ankle. Also, the suede oxford with rolled up skinnies look extremely graceful with these shirts. Polos are extremely classy with a great deal of sophistication, and you can add some modish vibes to this classic design when worn with the bermudas. Go for bright colors, and team them with subdued and neutral shaded bermudas to strut in style at the beach or pool parties. A perfect fusion of classy and punky! Look dashing and dapper in the chilly winters as you ditch the usual jackets and coats with the casual cardigans without any buttons on the front. These cardigans come in knit fabric, and apart from being super comfortable and cosy giving you warmth, they are versatile enough to be worn with the shirts, tees or polos. You can wear them at the beach or pool parties and also to the office on Fridays or to weekend parties. The leading wholesale clothing fashion destinations are adding new collections to the retail stores to help you with the best winter looks.